La Tradicion Cubana Churchill is a medium bodied cigar that boasts full flavor for a great price. The Churchill's wrapper is from Ecuador and the binder is C98 and the filler is Dominican. 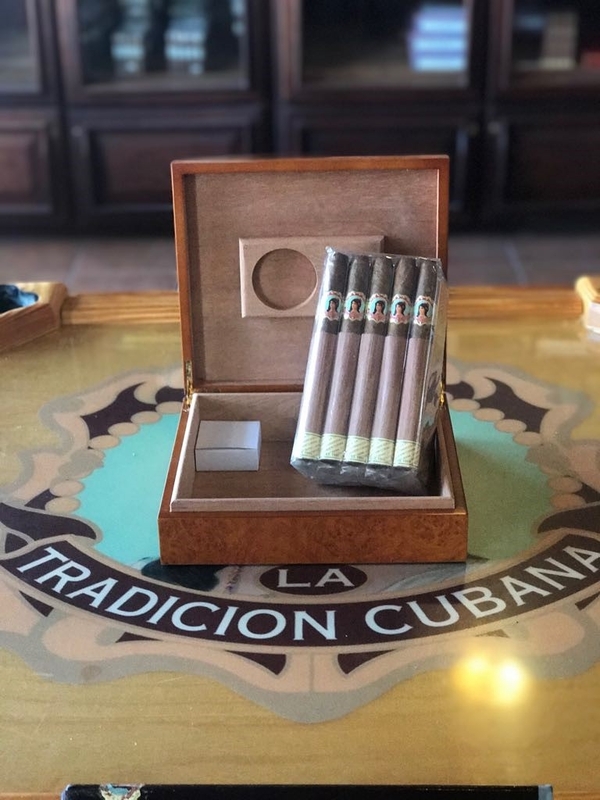 La Tradicion Cubana is a very enjoyable, fairly complex cigar with great flavors. This is an excellent morning cigar but can also be great at any time of day. High Gloss Burl Wood Exterior with a Spanish Cedar Interior. The Humidors interior is lined with Spanish Cedar, which helps retain humidity, while preserving the cigars. It also enhances the aroma and taste, and deters bugs from destroying wrappers. Gold Plated Piano Hinges, Scratch Resistant Felt Lined Bottom, a Humidifier and a Hygrometer are some of the features of this 25 Cigars humidor. 25 LTC Churchills and Humidor.